What ports does vSphere use? Ok, I have some knowledge about VMware vSphere, but I can’t remember everything. Good thing there are some people out there that have some good ideas about reference material. 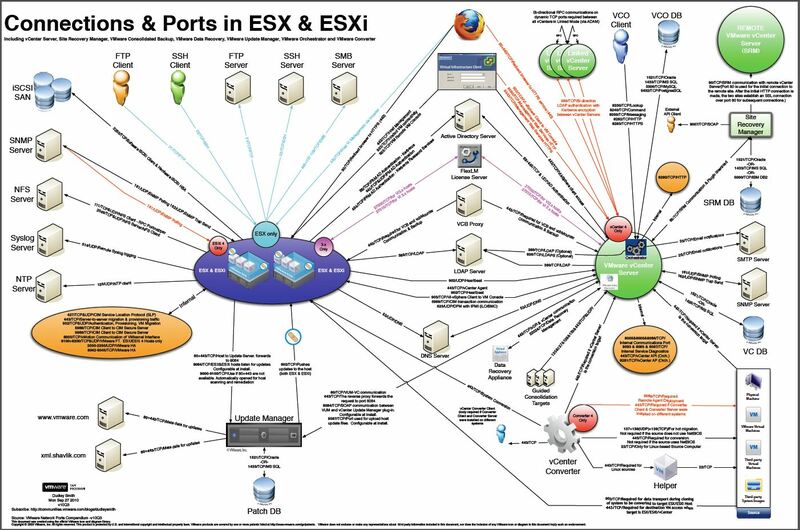 One of them is VMware Technical Account Manager Dudley Smith who created a nice diagram of all the ports used within a vSphere environment. Check out the blog post over here and download the nice ports diagram in PDF format. Update : Also check this KB article by VMware for ports used by VMware products. The picture on my site is not the actual picture. It’s just a snapshot. Please download the PDF document. This will enable you to view the ports.